An indoor pool building is a hostile environment that is continually subject to high humidity and condensation formation. Humidity in the air will condense into a liquid when it reaches its dewpoint, and that can occur in both visible and hidden locations. Vapor barriers and vapor retarding membranes are critical in the design and construction of an indoor pool facility. They prevent or severely limit the permeation of water vapor through walls, floors and ceilings where the condensation will be absorbed in insulation, limiting its effectiveness. The moisture can also cause structural damage such a rot and corrosion, wall cracking from freezing and damage finishes on wall surfaces. 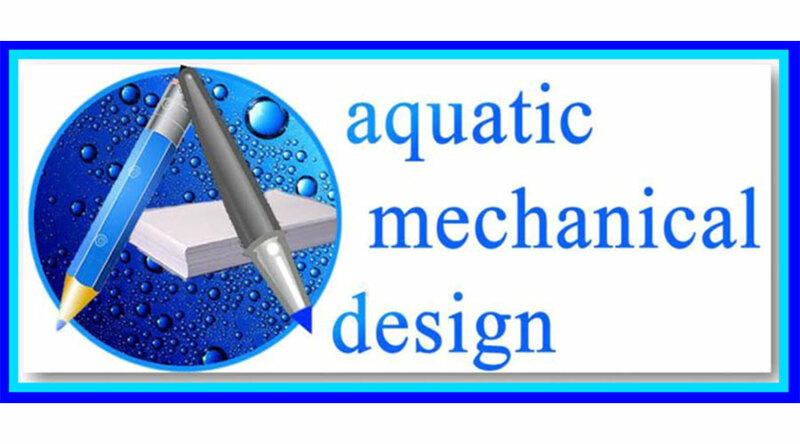 Inside surfaces are subject to vapor migration and condensation when moist, warm, pool room air migrates to an adjacent space and comes in contact with a visible or concealed surface that is at or below the dew point temperature. Besides structural damage, the increase in latent load can burden the adjacent space mechanical system. Vapor membranes must be installed near the inside surface closest to the pool room of the ceiling, walls, or floor. There must be no unsealed seams, cuts, cracks, penetrations, orvoids in the material, and vertical and horizontal seams must be overlapped and taped. All doors, windows and skylights need to have a high R-value and sealed from air filtration. Door and window frames should have thermal breaks, and structural steel beams must not go all the way through a wall above an exit door or window. Penetrations degrade a vapor retarder’s effectiveness if it has a very low permeance, and perforations may lead to air leakage, which further erodes effectiveness. Suspended ceilings are not suitable for humid pool room spaces, but if used, the cavity walls and cavity ceiling must have a continuous vapor membrane, with all seams and cracks thoroughly sealed, just like in the rest of the pool room walls and ceilings. Water vapor retarders are classified as rigid, flexible or coating materials and are available in a variety of styles including thin sheets, coatings and materials of multiple layers. Water vapor retarders are classified as rigid, flexible, or coating materials. Rigid retarders include reinforced plastics and are mechanically fastened in place and are vapor-sealed at the joints. 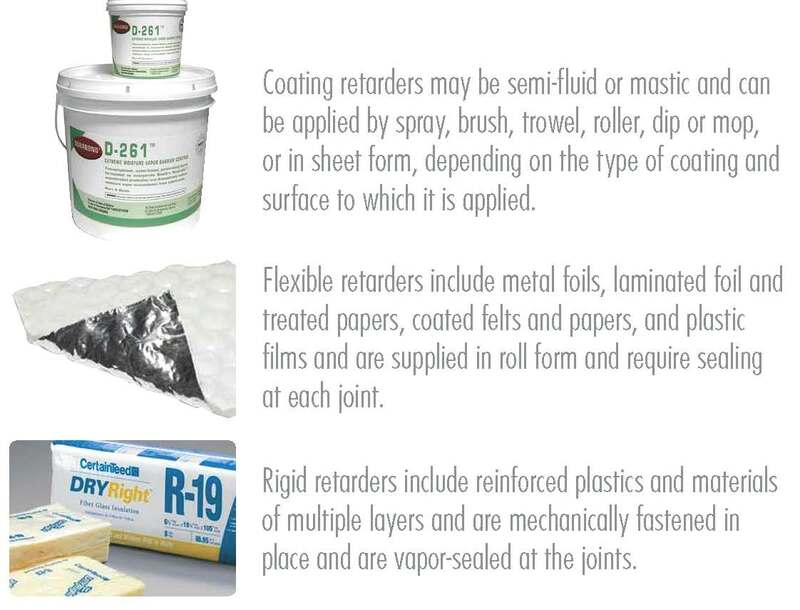 Coating retarders may be semi-fluid or mastic; paint or hot melt, including thermofusible sheet materials. Methods to prevent moisture migration in the walls, roof and floor surrounding a natatorium through the proper use of vapor barriers (vapor retarding membranes). If conditions are conducive to condensation, water vapor retarders help (1) keep insulation dry; (2) prevent structural damage by rot, corrosion, or expansion of freezing water; and (3) reduce paint problems on interior and exterior walls. Additional problems include window fogging; wet glass, sashes or frames; rot or corrosion of sashes or frames; visible condensation on indoor window surfaces; wet ceiling tiles, or soaked insulation; corroded T-bars and hangers; and sagging ceiling tiles in the pool area, or in related spaces. Condensation from this moisture must not form on visible or concealed surfaces of the pool room. For any outdoor air condition, indoor surface temperatures and concealed surface temperatures must be warmer than the dew point temperature of humid pool room air that may contact the surface. A comprehensive vapor retarding membrane must be part of the natatorium walls, ceiling and flooring system to prevent moisture migration to concealed surfaces. Condensation must not form on either the inside or outside surface of the vapor retarding membrane. Vapor membranes must be installed near the inside surface (closest to the pool room) of the ceiling, walls, or floor (if the floor is over an open space, such as another room). A vapor membrane may be an interior finish or construction material that has a low perm rating (0.10 Grains/Hr-Sq Ft per In of Hg of pressure differential, or less, across the membrane), or it can be a continuous low-perm membrane that is installed behind the interior finish. The exterior walls of the natatorium must be built such that infiltration of outside air will be blocked near the outside surfaces of the enclosed space. A vapor membrane at a warm-wet inside surface blocks infiltration, but local condensation will occur if cold infiltrating outside air contacts this boundary. Vapor membranes and infiltration barriers must be completely sealed. If the membranes or air infiltration barriers are not sealed, condensation can occur at, or near, leakage points. Exterior building wall and roof materials and insulation should be selected and arranged so that the effective R-value of any possible heat conduction path from an outdoor surface to a vapor membrane keeps the temperature of the membrane surface above the dew point temper rature of the air that contacts that surface. Condensation can occur on surfaces of walls interior to the building that encloses the pool room. If the moist, warm, pool room air migrates to an adjacent space (like a class room or office), and comes in contact with a visible or concealed surface that is at or below the dew point temperature of the migrating pool room air, condensation will form on that surface. The moisture migration to the adjacent spaces will also increase the latent load on the air conditioning equipment that serves the adjacent space If this latent load is greater than the air conditioning equipment’s capability, the space condition will be out of control. Vapor membranes that control moisture migration must be continuous. There must be no unsealed seams, cuts, cracks, penetrations, or voids in the material. All vertical and horizontal seams must be overlapped and taped. Seams at ceiling-wall interfaces and floor-wall interfaces must be sealed. Electrical outlets should not be installed in walls, roofs, ceiling or floors that are exposed to outdoor air, or make sure the penetration is completely sealed. Windows and skylights must be very tight. For cold climates, triple pane, high performance glass should be considered. Air and moisture must not pass though cracks in widows and skylight assemblies; or through cracks between rough opening frames and the windows or skylight frames. If a closed drape or blind covers a window, glass temperature will be colder and condensation more likely. Supply air should be provided between the window and any drapes or blinds. Closed doors must have minimum of air leakage and sashes must be very tight. Doors should have automatic closing devices. An air-lock vestibule is preferable for exterior doors and desirable for interior doors. Door and window frames should have thermal breaks in order to keep interior surfaces of frames from dropping below the pool room air dew point and causing condensation on the interior frame surfaces. Structural steel beams must not go all the way through a wall above an exit door or window. The interior surfaces of those beams can easily drop below the pool room air dew point and form condensation. Vapor-retarder materials are usually thin sheets or coatings. However, a construction of several materials, some perhaps of substantial thickness, can also constitute a vapor retarder system. Control of airflow and moisture movement might be achieved using an interior finish with a low-permeability coating, such as a vapor retarding paint, to provide the required low level of permeance. Several studies have reported a significant increase in permeance as a result of small holes in the vapor retarder. In general, penetrations particularly degrade a vapor retarder’s effectiveness if it has a very low permeance (e.g., polyethylene or aluminum foil). In addition, perforations may lead to air leakage, which further erodes effectiveness. Water vapor retarders are classified as rigid, flexible, or coating materials. Rigid retarders include reinforced plastics and usually are mechanically fastened in place and are vapor-sealed at the joints. Flexible retarders include metal foils, laminated foil and treated papers, coated felts and papers, and plastic films or sheets. They are supplied in roll form or as an integral part of a building material (e.g., insulation). Accessory materials are required for sealing joints. Coating retarders may be semi-fluid or mastic; paint (arbitrarily called surface coatings); or hot melt, including thermofusible sheet materials. Their basic composition may be asphaltic, resinous, or polymeric, with or without pigments and solvents, as required to meet design conditions. They can be applied by spray, brush, trowel, roller, dip or mop, or in sheet form, depending on the type of coating and surface to which it is applied. Potentially, each of these materials is an airflow retarder; however, to meet airflow retarder specifications, it must satisfy the requirements for strength, continuity, and air permeance.